The goal is to give everybody a tool that will help to understand how practical and beneficial it is to live according to these 12 values in our daily public and private lives. The booklets are written in a plain language and are presented in a fresh magazine style. Colors, pictures and the use of modern fonts are some of the techniques we employ to draw people into the reading and to a deeper understanding of the subject matter. The booklets start with the etymology and definition of the individual value, then they illustrate how to live that value in a practical way (i.e. how to be courageous and set ourselves free from fear, why one can’t be free until he frees his heart by forgiving, or how to be grateful and by it gain a joyful new perspective on life, etc…). Then the booklets reference internationally accredited studies from various universities and institutions reporting on the therapeutic effects of living by that particular value. By this methodology we encourage the practice of these values or virtues, not only because it works, but also because it’s healthy, whether physically, spiritually, emotionally or mentally. The final pages provide a wide selection of quotes from outstanding personalities, great thinkers and culture shapers, both classic and modern, who have reasoned about the given virtue with echoing agreement, yet each with varied worldviews the booklets are useful for young people, highly needed for adults. 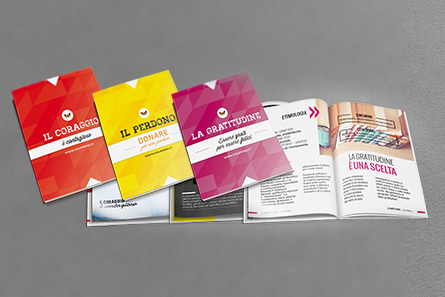 Currently, three booklets are available in English: Forgiveness, Courage and Gratitude. Contact us at team@ficagna.info to receive booklets to deliver to your friends and family.